Imagine for a moment if we could put a big box around the Sun, never mind why. (I suppose you could use a light bulb instead of the Sun, but stars are simpler than light bulbs, partly because their energy source is internal.) The size of the box isn’t particularly important, as long as it’s bigger than the Sun but too small to contain another star, and in fact the shape isn’t important either: the only thing that matters is that the box should enclose the Sun entirely. We’ll coat the inside of the box with photon detectors capable of picking up all kinds of light (again, don’t worry about the technical details), and we’ll cover the outside with some kind of gravitational detector as well, say a huge number of pendulums of a precise length. The gravity part is a bit more complicated, so I’ll leave that aside for now. The light part, however, could hardly be simpler: if we add up the signals from each photon detector, we’ll get the same number, no matter how big the box is or what shape it has. That’s because we’ve arranged things to catch every single photon the Sun emits: a bigger box means more detectors, allowing us to still capture each scrap of light. However, a bigger box doesn’t imply the Sun is making more photons: that number is fixed, set by the rate of fusion in the Sun’s core. The bigger box does mean the number of photons per square meter will go down (more on that shortly), but even if the box was really huge, you’d still get the same number. If the box doesn’t contain a star, the light detectors don’t trigger (left), but if it does, the light detectors will show the presence of the star. This is true however big or small the box is, or even the box’s shape. Now imagine we are alien scientists who have constructed a bunch of these boxes at random points in space, because we have a lot of money and not too many brains, and we have decided this is the best way to find stars. By taking data from the light detectors in each box, we can know whether there is a star inside or not. Without further work, we don’t know how big the star is or how hot it is or even where it lies inside the box, but we know how much total light it emits. In fact, the total amount of light is akin to a topological quantity. The presence of the star is like a hole in a piece of paper: the presence of the hole divides the types of curves you can draw into two categories. Curves that don’t surround the hole can be shrunk down into a single point—they are simply connected. Curves that surround the hole eventually can’t be shrunk in that way, even if the hole is tiny: they reach the boundary of the hole, and can’t go any further. Similarly, the presence of the star divides boxes into two categories: those that can be shrunk down to nothing, meaning they contain no star and detect no light, and those that cannot. This is a surprisingly deep discovery: we began with a goofy thought experiment about putting a box around the Sun, and ended up finding a connection to abstract mathematics.The analog to a topological quantity here is luminosity: the amount of energy in the form of light the Sun or star emits per second. This quantity can change in time: stars pulsate, produce flares, and so forth, so it’s not a perfect connection, but at a given moment in time, it works. In physics, we rarely ask for perfect fidelity between mathematical ideas and observational results: it’s usually enough to provide a conceptual landscape. Since the shape of the box is irrelevant, it frees us to pick a simple one, such as this cube. The distance from the star at the cube’s center to the edge of the cube is r.
If the total number of photons incident on the box is the same, regardless of size and shape of the box, then we can use that to help us determine how bright a star appears from a long distance away. A star emits light more or less equally in all directions—I’ll come back to that “more or less” at the end of the section—so for simplicity we can make the box a perfect cube with the star at the center. (Usually when I taught this subject in physics or astronomy class, I used a sphere instead, but again, since we’re dealing with topology, the shape choice is arbitrary. We’re not after all the mathematical details.) We’ll say the size of one cube face is A, so the total surface area of the cube is 6A (like an ordinary die you might use to play Monopoly or Yahtzee or whatever). Each side of the cube will have an equal amount of light passing through it. How topology leads to the inverse square law: photons travel outward from the star. Since the total number of photons is constant, they must disperse as they travel outward, meaning the same number of photons are distributed over a larger area. 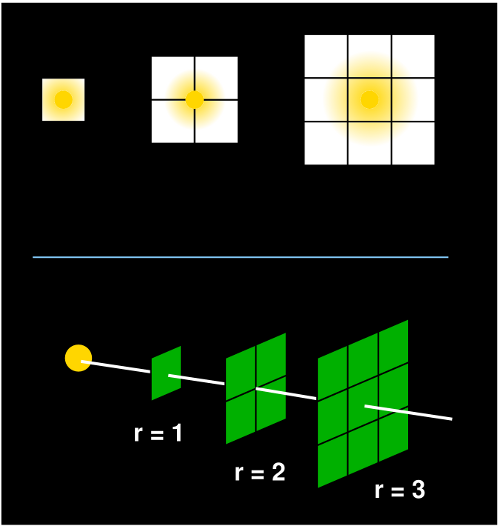 The two images show that distribution increases with the square of distance, so to keep the photon count constant, the intensity of the light must drop with the inverse square of distance. We’ll call the distance from the star at the cube’s center to the edge of the cube r, so the length of one side of the cube is 2r. What happens if we want to look at the star from double the distance away? That’s equivalent to taking eight copies of our original cube, making each side of the new cube 4 times the area (see the image to the left). Similarly, if you want to look at the star from triple the distance away, you make a cube where each side is 9 times bigger than the original, equivalent to 27 of the cubes we started with. We’re interested mostly in the relationship between surface area and distance from the star, not the number of cubes. After all, the photons spread themselves across the surface of the box. However, the surface of the whole box grows at the same rate as each side, since the total surface area is just 6 times the area of one side. This means we can stick with one side, as shown in the lower panel of the image at the left. The total number of photons passing through each set of green squares is the same; they are just spread out more and more the farther you get from the star. Notice there is a relationship: at r = 1, we have one square, at r =2 we have 2*2 = 4 squares, and at r = 3, we have 3*3 = 9 squares. This is known as the inverse square law: the apparent brightness of a star gets smaller as the distance increases, by a factor of the square of the distance inverted. Double the distance and the star appears 1/4 as bright; triple it, the star appears 1/9 as bright; look at it 10 times farther away, and it will be 100 times fainter. This is why stars that are intrinsically much brighter than the Sun may be entirely invisible from Earth. Now we’ve come full circle: we began with a dumb idea (boxing the Sun), related it to topology (the presence of the Sun in the box playing the role of a “hole”), and then showed how the topological idea lets us see how the Sun appears fainter the farther away we look at it. We could continue along this line of thought and show how the temperature of a planet depends on all this, but I won’t get into that today. As I mentioned previously, ordinary stars emit light more or less equally in all directions. However, that’s not a universal thing: some sources of light are more like lasers, beaming in a more focused way. However, our original topological idea is still legitimate: the total number of photons is still a constant quantity, but they are concentrated on one side of the box. That means the inverse square law isn’t valid for beamed sources, but that’s OK: we can adapt our methods for cases where things aren’t perfectly (or approximately) spherical. In our original thought experiment, we included gravitational detectors on the outside of the box as well. However, there isn’t an immediately detectable analog to the number of photons. Gravitational detectors like pendulums measure the acceleration of gravity, which weakens the farther from the star you travel. However, we have a ready-made quantity that’s even more stable over time than luminosity: the star’s mass. The best way to measure mass of an object in astronomical situations is by tracking the orbits of bodies around it. (I’ve discussed that idea in several previous posts.) However, I think we can agree that the value of the star’s mass doesn’t change depending on where you measure it, so the box surrounding the Sun or star can be any size or shape. So, mass is another topological quantity—and in fact a more reliable one than luminosity. While stars do lose mass (especially toward the end of their lives), it’s not a significant fraction for most of them. Following the same logic we did before, we obtain Newton’s law of gravity: Here, the “strength of gravity” isn’t the same as the gravitational force. Instead, it’s expressed as the acceleration, which is the same for every falling body (in the absence of air resistance), as Galileo realized, though the language he used was different than how we express it today. The inverse square law of gravity in Newton’s law is probably the most important result in all of astrophysics: it shows why Kepler’s laws are correct, describes the motion of stars in galaxies, and when combined with other equations elucidates the internal structure of stars. “Now Matthew,” you say, “isn’t general relativity the correct theory of gravity, not Newton?” It turns out general relativity mostly agrees with Newton’s law of gravity, and the topological statements I made still hold true. The difference is not in the topology, but the geometry: gravity changes the shape of spacetime, so the relationship between the distance r from the center of the cube to the area of the cube’s surface doesn’t hold. For stars and planets, the deviation is small enough we don’t notice, but for exotic objects like neutron stars or black holes, we can’t ignore the break from Newtonian physics. As always, there’s a lot more to the story than I have space to tell here. The inverse square law is rarely framed as arising from topology, but it all connects to something known as Gauss’ law, one of the fundamental laws in physics. Gauss’ law usually shows up in electromagnetism, but its application is far wider, especially when you realize how it connects to the topology. I have wondered from time to time if we could try teaching electromagnetism this way, so maybe I’ll follow up this post with one outlining my idea. 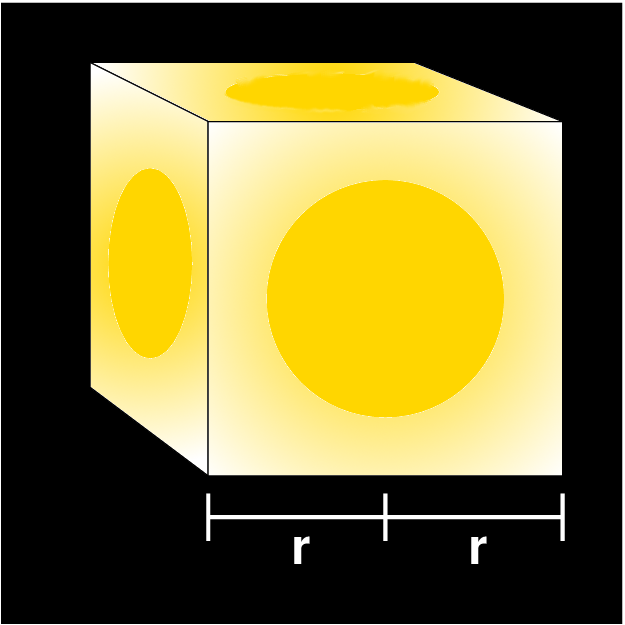 The inverse square law of the propagation of light was first deduced/proposed by Johannes Kepler. The first person to propose an inverse square law of gravity Ismael Boulliau did so in analogy to Kepler’s light law. Ah, excellent! I did not know either of these things. Scratch that: upon reflection, I do remember Kepler obtained the inverse square law for light. My brain is being slow today. Do you know the relationship between a star’s mass and luminosity? At least for the main sequence?